Can you still use the stock sights on a Ruger PC9 with this mounted? Will this fit on a M-Lok Rail? What adapter would I need to buy? BEST ANSWER: Mlok refers to the slots on the rail that are usually on the sides and bottom of the rail. The top of the rail usually has a picitanny rail/slots. Optics should not be mounted on the rail though. (Unless it is a monolithic upper, somewhat rare). The top of the upper(non carry handle) will have picitanny rails and this optic will mount directly to the upper with the provided mount. M lock is the slots in the hand guard. Your upper should already have 1913 rail on it anyway! MOUNT STRAIGHT ONTO THAT PIECE OF RAIL, AND YOU ARE GOLDEN! 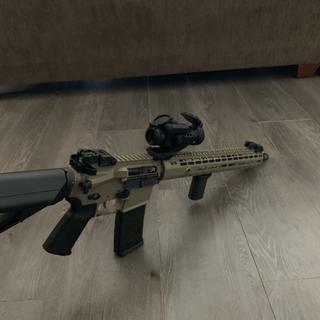 The optic comes with a mount, so nothing needed unless you want to raise the optic to cowitness with something like tall iron sights, a magnifier, night vision, etc. Then you would buy a small 1913 1913 riser piece, but there is no need with just the red dot. Is this a 1x unit? Yes, this i s a 1 x Red Dot. The heading says "4MOA Red/Green Dot", but nothing in the description mentions a green dot. Is it both??? BEST ANSWER: Yes. It it has a green or red dot. 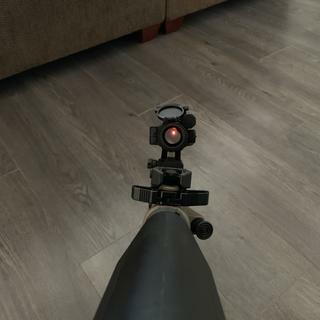 Just hold down the up button for a few seconds after starting up the scope and it will switch between red and green. It will stay on your last setting. I would not trust zero from red to green. They are very close in point of aim and point of impact but if you are competition shooting or doing anything longer range then zero on the color dot you will be using. It has two color modes with numerous intensity levels for red and green. You can switch to either color. Would this be an absolute or lower 3rd co-witness on an AR with the A2 FSB? BEST ANSWER: The mount with that comes with it is a lower 1/3. Absolute co-witness mounts are available. Which do you want it to be ? Different mounts will make it different ! 1/3 lower than what ? BEST ANSWER: Yes all mounts are included. The minute you get the package opened it can be on your rifle. I'll add in too that this is a fantastic optic, had mine for a year now and it's been great! It comes with a cantilever mount. It mounts directly to the pic rail on the top of the rifle. As long as you have a pic rail your good to go. Everything you need is included. It even comes with flip-up caps for when you're not using it. I'm tickled with mine. Everything is included and mounting and removal is easy yet secure. Yes, it includes the rail mount you see in the picture. Yes, what you see is what you get. It will Mount fine. Is this parallax free like aimpoint? BEST ANSWER: Yes. To be honest for the money it's the best buy on an optic I've seen in years. Works well in any lighting and holds zero well. It does have a slightly larger dot than some other models but not really an issue. will this fit on a colt AR? BEST ANSWER: As long as your upper has rail on top and not a carry handle it will fit. Of course.... Any mil-spec upper. What battery does this use? BEST ANSWER: Nice optic. Love it. Comes with a battery. Worth every penny. Does it only work as a red dot when under battery power? Or does the lens have etching for normal use? BEST ANSWER: The StrikeFire II work with a projected dot. In short, no power, no dot. The glass is clear and not etched. Battery Only. You need a prism to have the etched. Would this red dot be able to withstand the shock from a 458 socom? BEST ANSWER: I'm using it on a .450 Bushmaster build and haven't had any issues, so probably yes. Would this be a good option for a 300 blackout shooting subs. At coyotes in lowlight conditions? Extra high recoil rating? Please specify. BEST ANSWER: I’ve used on a 30-30 Henry. No issues. Can this optic be mounted using a different mount other than the supplied cantilever mount? I purchased this scope yesterday and typed in the code at checkout but it didn’t show that I got one? Optics works great personally prefer the green dot over the red. And as personal preference for looks, I’m looking to change out the mount. A bit large for what it is. I have nothing negative to say about the product except its size for being zero magnification i feel is a bit on the large side. Performs flawlessly under every condition ive had it in though. I bought this site from PSA when they were running a sale, to try. It came with a cantilever mount and was easy to install. I put it on an AR that I had purchased from Wyoming Arms. First shot for rifle and site were right on the money. Excellent site for the $. The on/off/illumination buttons are difficult to manipulate, especially while wear shooting gloves. Turning site off is cumbersome. That’s the only reason I didn’t give it 5 stars. Vortex make really good optics! Really good dot optic. I also run Eotech EXPS and Trijicon MRO and this optic definitely belongs in the group. The light adjustment dial (brightness and color, red or green) is not the highest quality as the graduations are not pronounced and it is quite tight to turn. I run this on my carbine versus my ARPs as the added step of turning on the optic and dialing to the preferred brightness requires some extra steps before you can attain your sight picture and address the threat. Excellent choice. It was everything I was looking for and more. Picked this up on sale, and so far it works great! Nice bright dot that makes it easy to aquire targets. Palmetto State Armory is an awesome place to do business with. Awesome red dot. Second one I’ve had. The first one I sold with the rifle it was on and regretted letting the red dot go. So happy I’ve got another now. New to the optics game but this was easy to setup and use. Good site, for the price. Good product, wish the dot was more crisp. Does everything I need it to do. Sighted it in, and shot several hundred rounds. Appears to be of solid construction and quality. We'll see what happens after a summer of shooting. Even if there is a problem, Vortex's warranty is unbeatable. Definitely am going to buy another for future builds. Have several Vortex optics, and the price was too good to pass up. Another quality optic at a great price. It comes with the mount so nothing extra to buy. Just open and install.Clear, easy to sight in. Bang! here we go, when i first got this , it looked complicated, took all of five minutes to install, and was just as easy to set up the sites. Works just great. Using on a 300 Black pistol and indexes perfectly. I’ve been using it for about a month and love it. Holds zero and has great glass. Love the night setting as well. I'm wicked picky about saying it can't be beaten for the money because I think that means that people are accepting lower quality for the price. Not in this unit, its tough, bright, the mount looks cool and its accurate has heck. Vortex warranty make this an absolute no brainer even if you switch out for thermals or other use cases like I do. Built with good quality. The laser beam is crisp and bright. Very easy to get centered. Quality was good, a nothing fancy unit. Rugged and reasonable. God combo. Goes on every M4 build. Perfect for the ks47 ar pistol in 7.62x39. So far so good. Like the lifetime warranty. Easy to mount and zero in. I installed on my M1A SOCOM 16. An awesome deal for a great product. I’ve never been disappointed with anything from vortex, and this is no different. Great red/green dot. The quality on the Vortex optics seem to be of a higher end at the mid price range. I have purchased a couple of these and don’t think you can go wrong. Vortex also has about the best warranty you can have. This is my second one of these. Overall, a bit large (heavier) than other “dot” sights; but being a Vortex customer for all my “glass” optics and spotting scopes, it’s a great option. The lifelong warranty is worth the extra size/weight issues. Probably not the best choice for tactical situations, but solid performance in a multi-option sight. Not worth the money. Just save the money and buy a better optic. The parallax is horrible and it wasnt a good fit for any type of shooting. Biggest waste of money I've spent. Great sight.. not the first one I have bought, but it is the first one I’ve bought that came with 10 free pmags! Great sight great price! Have been wanting one for a long time. Love everything about it. There may be some scopes that are better, but not for the price. Easy to use and adjust. I own 2 Vortex Strikefire II scopes. I have one on a Springfield Saint AR pistol that replaced the installed Burris fastfire and the other on a Beretta ARX-100. I just prefer the Vortex over the Burris in performance options for the Saint application. Nothing wrong with the Burris. The optics, features, and weight of the Vortex rival more expensive scopes and the price at Palmetto was even better than the first one purchased on sale for $149. This is the second one I have. I am extremely pleased with it. Recommend to anyone looking for red dot. Include in your next build, buy it all thru PSA! This is one of the best RDS's on the market, and not just for its price range. As far as I'm concerned that is. It really helps that PSA has the lowest price anywhere for it! Easy to calibrate. This is my first red dot, but I like the toggle for red or green. Definitely, recommend cantilever mount for co-witness. All in all nice optic. PSA did a great job, no damage in shipping. A great red/green dot at a great price! You just can't beat this scope at even twice the price. It does everything it says it can do. Plus Vortex's VIP warranty means your scope is covered for life, no questions asked. You can't get a better warranty anywhere. Buy it, you won't regret it. Easy installation and easy setup. User-friendly and very accurate at 200 yards. Was able to get sighted in with about 75-100 rounds.